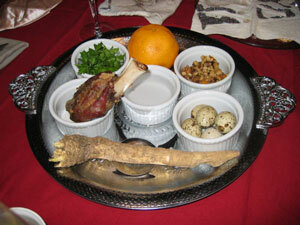 What’s on Your (Seder) Plate? Some may consider the orange a symbol of women’s rights, derived from a man supposedly telling Professor Susannah Heschel that “a woman belongs on the bimah [in a leadership position in the congregation, or reading from the Torah] as much as an orange belongs on the seder plate.” But Heschel herself has said that no such exchange took place, and the orange has a different meaning. Reflecting on when she added the orange to her seder plate in the 1980s, she says it was to be eaten “as a gesture of solidarity with Jewish lesbians and gay men, and others who are marginalized within the Jewish community,” including widows. The seeds, symbolizing homophobia, were to be spat out. Bottom line: There’s room for more symbols on the seder plate — and room for more participants around the seder table. The full Time coverage is here.